I consider myself pretty handy. I can do most of the repairs required around the home and I even have moments when I can actually build something unique and useful. 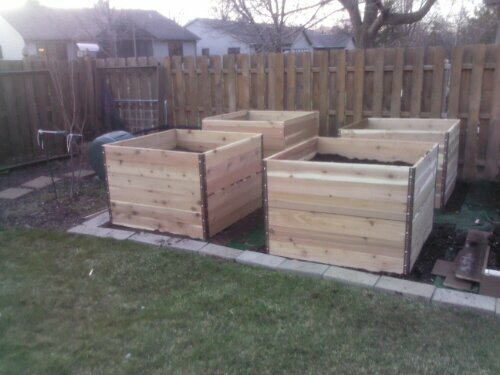 So when I decided to make it easier for me to garden, I decided to build raised garden beds. Now, I had seen pictures of these types of beds in catalogues and articles so designing them was not that difficult. Building them was another story. My first attempt, or what I call my prototype turned out pretty good, from a distance. If you get close you can see a lot of imperfections. My second one was a breeze, even though it took about 5 hours to build. My third one was the problem child. I had it completed, except for two boards and realized I had to take it all apart and start over. As I look at them now, I am pretty happy with how they turned out, again from a distance. Even on the ones that seemed work out better have a lot of imperfection if you get close enough to them. Sometimes I think I am like these boxes. From a distance my life seems pretty well put together, but if you get close enough you can see the imperfections. I try very hard to live the life that Jesus wants me to live….to be the person that Jesus wants me to be, but that is the problem. I try to do it on my own abilities. Psalm 127 says, ” Unless the LORD builds the house, those who build it labor in vain.” You see, God has a plan and design for my life. The interested thing about His design is that He is the only one that can use it. He is the architect, I am just one of the many tools in his toolbox to make my life the way it should be. God uses the abilities He has given me to build me into the man He wants, the man that fits His design. Another tool He uses is the people He puts into my life. The trick is that I need to allow them to get close enough to me to see my imperfections. As much as I want them to see me from a distance and only see what I want them to see, in order to grow and become everything that God wants me to be, I need to open and honest with those he brings into my life. This is not easy, but it is what God wants. This entry was posted in Uncategorized and tagged Building, grace. Bookmark the permalink. Well written! As your inner vision growns in His understand so will your outer vision prosper. Never be afraid of personal imperfections, given to Him they are the seeds that produce character.